Mr. Postman, is there's a letter in your bag for me? Early this summer, I received a lovely handwritten letter from my friend, Jan Fuller. I suddenly felt happy at the thought that someone took the time to hand write a letter to me. The letter sits on my desk as inspiration to me to be more thoughtful in my own communications. The next step, on my journey towards more considerate communication, was to log on to the Felix Doolittle website. Felix Doolittle is an amazing artist who uses his magical illustrations to create a beautiful line of extraordinary illustrated papers. He offers a stationary collection with calling cards, book plates and many other cool items that you can personalize with your choice of his signature illustrations. You have to see it to really appreciate it. I thought the Sweet Dog Organics readers would be particularly interested in the beautiful dog illustrations that Felix Doolittle offers to his clients. 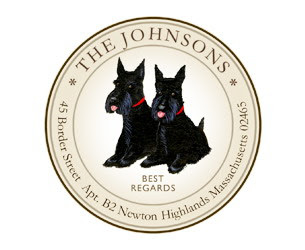 They offer more than 30 illustrations of dogs (different breeds) on their notecards, correspondence seals, address labels and other products on their website. I agonized over choosing the Felix Doolittle illustration that really defined my personality or lifestyle. There were no illustrations that seem to say "Hey, look at that woman being dragged down the street by three Labrador Retrievers. Is her shirt on inside out?". I finally decided on the "whale rider" illustration which shows a girl swimming in the ocean with a whale. The truth is, life seems quieter and more balanced when I am literally underwater. I ordered the return addresses labels and love them. To help us define our life and encourage thoughtful communications, Loren and the folks at Felix Doolittle are offering the Sweet Dog readers 15% off your total order until the end of the year. Use the coupon code, BARK4FD, listen (maybe sing) to a little music and enjoy! FULL DISCLOSURE NOTICE: In preparing this column, I did not receive products or compensation from Felix Doolittle. hey, I know that friend of yours! ;o)She's a gem! Thanks for all the posts!